The sunshine yesterday made all the difference, even if it was still quite chilly in the morning. The birds were enjoying it: I didn’t have to walk in for half an hour before I started seeing birds. Indeed, the sparrows from last weekend were all feeding just past the first bridge over the creek, and several Red-Winged Blackbirds were busy proclaiming their territories. There were not a lot of waterfowl, but mixed in with the regulars were a couple nice surprises, like the Wood Duck above. My view over the first bridge – nothing in the water, but at least it’s not frozen. Actually the first ducks I saw were Northern Shovelers. There were two males and one female. I think they’re quite striking. This pair of Mallards might be staying. I caught the three below flying over the river. The first fight of the day over territory was between two Downy Woodpeckers. American Tree Sparrows were everywhere. This is another result of the tree removal, I’m sure. Some Song Sparrows will be staying. I kept hearing one singing, but could not find his perch. The one on the ground below will have to do for now. There was only one pair of geese, and I’m thinking it’s the same pair I saw last week. Cardinals were abundant, if hard to capture. I walked down to the Des Plaines to see if there were any more ducks or maybe a heron. The sunshine illuminated the graffiti under the bridge. There were about a dozen Common Goldeneye from my vantage point, but no herons. I liked the sunlit reflection of the trees in the water. I never take pictures of people on the trail but it was nice to see this guy out early with his son and two dogs. It’s too bad they flushed the Wood Duck, it would have been nice to show it to them. Oddly enough for the beauty of the day, they were only humans I encountered. The accompanying landscape shots are just more bare branches and water waiting to wake up. I left the Portage around 10:30 and drove to McGinnis Slough where I found enough surprises to fill their own blog post, so I will be back to report in a few days… I hope you are enjoying your own version of the anticipation of spring. Last year two fellows I run into occasionally at the Chicago Portage, Steve and Mike, told me they had seen a Great Horned Owl. I believe it was Mike who showed me his stunning photo of the owl sitting on a stump over the water. But I never saw the owl until two weeks ago making my return trip on the trail that runs along the south side of the stream, when I flushed it and watched it fly to perch in a tree on the other side. Then last weekend I saw two owls perched on the same branch, looking down at me. The first owl decided to take off when I lifted the camera, but the second owl sat there and stared sleepily at me. So are they a pair? Most likely. I suspect the first owl is the female as it is larger. Then I wonder if they have a nest somewhere or if they’re shopping for one. Will I see baby owls? It’s more excitement than I can handle at the moment. But I do suspect that the owls’ presence will keep the other raptors I normally expect to see at the Portage away. The Portage keeps changing. More trees coming down. I was saddened to see one of my two favorite birch trees in smaller pieces. I can’t imagine what was wrong with it. I have seen Blue-Winged Teal the last two visits as well. I suspect they’re just visiting though and will go elsewhere to breed. And a Canada Goose seems to have found her nesting spot in tree trunk. Last weekend there were a few Yellow-Rumped Warblers, although only one captured by the camera. I was very happy to see a Tree Swallow last weekend. Not so many sparrow species. Song and Fox Sparrows, still a few Juncos, and American Tree Sparrows still hanging on through the cold not-quite-spring-weather-yet. A few more captures before I go… White-Breasted Nuthatch, American Robin, preening Mallard, American Goldfinch. These pictures were all taken on April 8 and April 22. Unfortunately I don’t expect I’ll be getting near the Portage again until May 12 when I’m leading a small group on a bird walk as my donation to the fundraising member auction for Unity Temple. Until then, I will be traveling at a slower pace. Yesterday I had stem cell replacement therapy on my right knee. The procedure itself was not too awful, indeed I told the physician that his description of what he was about to do to me was far worse than the actual operation and I am hopeful recovery goes smoothly. I’m feeling better than last night: I woke up with very little pain, so now it’s more a matter of keeping stable using crutches for a couple more days to keep weight off the joint whenever I can. I’m looking forward to the final portion of the therapy on Tuesday which involves a simple plasma injection. If the weather is nice, which it is predicted to be, I will be spending the time in between blood draw and later injection birding North Pond and the Peggy Notebaert Museum grounds, a local birding hotspot right across the street from the medical building. I couldn’t have picked a better location to have this done! On workdays, I can take a short walk along the Chicago River downtown sometimes in the early afternoon, weather permitting. Invariably there are always a few gulls. Herring Gulls watched over the river all winter, and now the Ring-Billed Gulls like the one above are coming in. I have decided it can’t hurt me to get better acquainted with them. With the change of seasons other birds show up as well. Last week one day there were about twenty Red-Breasted Mergansers. I first followed one female fishing alone in the water right outside my office building. When she took off in a northerly direction, I followed her and soon found the rest of the group. Several of the males were hanging around together. Also going on the last couple weeks, demolishment of the General Growth Properties building. The low-rise structure broke up the dominant high-rise footprint but predictably, a huge development devoted to office space is going in its place. It was nice to see the Red-Breasted Mergansers well one more time before they take off for their northern breeding grounds. They were busy disappearing quickly into the water for fish, and try as hard as I might, I could never capture the actual dive. The light made interesting reflections on the water and the buildings. I have to wonder how it looks to the gulls that navigate this corridor daily. Below is one of the Canada Geese that likely breed somewhere along the river this time of year. I keep thinking I see the same couple every year, in which case I imagine this could be the gander who swam off too far from wherever his beloved is nesting while patrolling the river, and is in a hurry to get back. We are still enduring a blustery chill, but the sun is out today, at least for a while before the cloud cover comes back and the predicted rain will turn to snow. I doubt there will be much accumulation, and we may finally get a spring warm up toward the middle of next week. Migrant passerines are starting to show up, the cardinals were engaged in a sing-off this morning, and I am thankful life still has a reset button. If I’d given it much thought I might have gone to the Little Red Schoolhouse yesterday to chase a lifer. There’s a Prairie Warbler there, and to the best of my knowledge I may have heard one but I’ve never gotten a definitive view. But after a too-long-put-off thorough cleanup of the living room (my putting off has consequences – there are a few new residents), I was too tired to think and the best I could muster was a visit to the Portage, and, after all, I haven’t been there for a couple weeks so it’s always good to see what’s happening. American Robins were everywhere, from busy adults feeding their likely second brood to fledged birds figuring things out. I estimated 50 or more. Most of the usual suspects were there but there were notable omissions. I didn’t hear or see one Song Sparrow, nor a Yellow Warbler. The Green Herons don’t consider this a proper place to raise young anymore as the water levels have changed too radically. And I don’t know if it was because it was cool and windy, but there were no butterflies, hardly any insects at all, except for a few dragonflies. Always hearing Warbling Vireos – there’s at least four singing males – but rarely get to see one, so this was the best I could do as this one was navigating a branch. At least you can see its blue legs (if all else fails, this confirms it’s a vireo). Indigo Buntings also breed here a lot now, but the only one I could get even half a photograph of was the juvenile above with a strange white patch on his tail feathers. After weeks of hearing a Carolina Wren and never seeing it, I finally saw two. Although I did not see the singing wren, I believe the two below are his mate and offspring. He was singing clearly from wherever he hides so I’ve included his song below the pictures. One of the Southwest Airlines flights over the Portage…and thistle in various stages of bloom, unfortunately not occupied by American Goldfinches as in visits past. Birds were not the only wildlife. A young White-Tailed Deer appeared in front of me on the trail. And a Beaver swimming quietly through the open water. Above, a Gray Catbird on the left, and a section of a large birch which is one of my favorite trees. I was surprised to hear and then see the American Redstart below. This is the first time I’ve seen any warblers other than Yellow Warblers here during breeding season, but it’s not out of its range. One lone Canada Goose sampling the duckweed portion. Meanwhile back at home, blooms are starting to happen. My forest of Purple Coneflowers is off to a good start. I hope some butterflies show up soon. The bright yellows…of a bee on something I should recognize but somehow almost everything that was planted in my front yard is still strange to me, I have to get out the books and study. On the right below is the Rudbeckia that was budding last week and the first of many sunflowers planted by the inevitable scattering of black oil sunflower seed. All the milkweed in my front yard has planted itself, and it is blooming beautifully. And it is fragrant. I am not used to smelly flowers, this is quite unexpected. I hope it smells enough to attract Monarch Butterflies. On another note, a section of my yard has been plagued by the plant below for two years and I spent an hour yesterday carefully digging out as much as I could, hoping anything I planted around it will take over. I don’t know what it is, so if you are a wizard and can identify it I would be most grateful. A few more photos of the lovely Mallard family that was swimming around in the low-lying land next to the Des Plaines River. I counted nine ducklings. And one more of the Carolina Wrens. McGinnis and the Little Red Schoolhouse are on my mental list for next weekend, weather permitting. Even if the Prairie Warbler isn’t available, there are often Red-Headed Woodpeckers, which I don’t get to see too often. Maybe there will be some butterflies too! It was raining and cloudy when I woke up this morning and the forecast as read on the radio didn’t sound too promising, but then the clouds appeared to be clearing and I had no more reasons to dawdle, so I set out for the Portage. My timing was right – there were a lot of sparrows and three species of woodpecker which isn’t phenomenal but one, a Hairy, I hadn’t seen in a while so that was special. There was a lot of fungus growing everywhere which made me realize just how much life goes on in spite of the cold and snow. Northern Cardinals were abundant but distant, even with the long lens. I don’t know what happened with my setting on the right, I am unaware of changing anything but I must have hit a button somewhere, but maybe the contrast is interesting anyway, seeing as how the sparrows were blending in with everything. American Tree Sparrows were most abundant. This was the only Dark-Eyed Junco that didn’t fly away immediately. Several hardy little Song Sparrows surviving our surprise winter. A couple pictures of the thaw. No birds in the water but some flew over as if considering it. The Red-Bellied Woodpecker was enjoying the sunshine. Milkweed pods almost looking like birds hanging from their stalks. It was wonderful to be out. I had the place virtually to myself and it felt like home again. I made an early resolution to spend more time in these woods, to bear witness to the changes of the seasons, the habitat, and the inhabitants. The Blue-Winged Teal at the top of the post were swimming around when I first saw them but as I tried to get unobstructed views to photograph, they flushed, and sadly the best picture I got was of two in flight. I hate flushing birds but as I progressed along the path I think all 8 of them would have left anyway. It’s still surprising to me to see people working on Sunday, but there these guys were, working on the new shelter right off the parking lot. With the unseasonal weather confusion, still seeing some winter species like the American Tree Sparrow below. I took the photos of these two female ducks before identifying them. The one on the left appears to be a female American Black Duck. The one on the right, however, appears to be a hybrid American Black Duck-Mallard female. It took me a while to figure out the second one. My reasoning for the ID on the second one is the plumage. There was also one Canada Goose sitting in the water but so still she appeared to be sitting on a nest. An Eastern Phoebe was my first of the year at the Portage. Even though I saw this bird in two locations I suspect it’s the same one. Such was the grayness of the day that even pieces of wood appeared to be possibly alive. 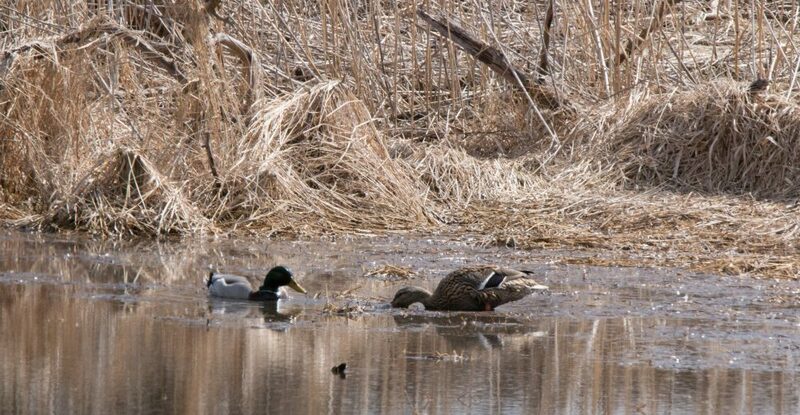 Below, two Mallards dabbling in their bottoms-up fashion and a male Mallard. There were a few American Goldfinches present, none showing any more color than the one below. And there are always Downy Woodpeckers. American Robins are always here too, only now beginning to look fancy. An average day at the Portage, perhaps. But then The Big Surprise occurred as I approached the parking lot and this Bald Eagle flew over my head. It appears to be an immature bird, Bald Eagles attaining their adult plumage after about five years, so the head, for instance, is not completely white. But to see a Bald Eagle in my neighborhood – well, it is around the Des Plaines River, but still, barely a mile and a half from where I live – this is really amazing to me. Apparently not unusual, though, because when I reported it to ebird my sighting was not questioned. Below is another shot of the Eastern Phoebe. I love these birds, they’re so cooperative. I owe you one more post from Nicaragua and then maybe the snow will melt for good and we can get started with spring!